June 19, 1975-Former boss of the Chicago mafia, Sam “Mooney” Giancana is shot and killed in the basement kitchen of his home in Oak Park, IL. Giancana had been extradited from Cuernavaca, Mexico and was scheduled to give testimony to the newly formed Church Committee. Some have speculated that his murder was to silence the old mafioso in the fear that he might reveal an unknown number of secrets about the American mafia and its relationship with the Unites Government. His death shocks the nation and raises many more questions about the events in Cuba, Chicago and Dallas, Texas. For several decades, he ruled Chicago with an iron fist and was privy to nearly every major event to occur in the Windy City. 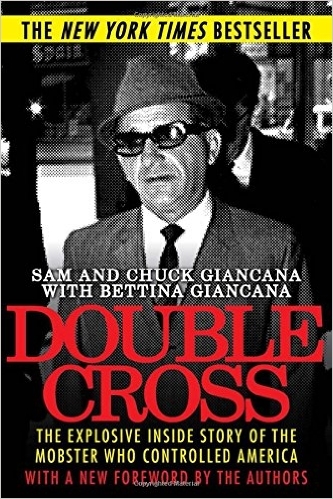 ‘Double Cross’ is the inside story of Giancana’s life by his younger brother, the late Chuck Giancana, Sam’s nephew also named Sam and Bettina Giancana, a published author and recognized expert in the field of organized crime. The book is written like a novel but it is far from fiction and this story of the mobster who controlled America is one of the most revealing books I have ever read and helps to reader to understand just how powerful the mafia had become in the United States. Years before the RICO act was designed and used by prosecutors to break the backbone of organized crime, the mafia controlled nearly every aspect of American society. And among these power players was none other than Sam Giancana, whose reach stretched from all corners of the country, countries abroad and even to the oval office. The son of Italian immigrants learned the tricks of the trade through the hard knocks of life on the gritty streets of Chicago which at the time, was the city known to be a haven for organized crime featuring such characters as Hymie Weiss, Al Capone, George “Bugs” Moran and Dion O’Banion to name a few. And his stint in Joliet prison served to toughen his character making a more hardened and remorseless gangster. His brother Chuck, at his brother’s side for most of their lives, recalls their discussion about the events of the day and the secret world of the Syndicate. And as we listen to Chuck while he tells us what he remembers, we begin to see a very dark portrait of a dangerous, power-hungry, merciless and intelligent person fully entrenched in the underworld where he would remain for the rest of his life. When John F. Kennedy’s election campaign began to pick up steam, it became evident that some states would need more attention than others. An Irish-Catholic had never been elected President and many of the toughest states were Protestant strongholds. One more than one occasion, it has been alleged that Joe Kennedy bought the election for his son. We do know that Richard Nixon’s campaign wanted a recount, but their efforts were nipped in the bud by officials in Illinois. If Chuck’s words ring true and other sources are to be believed, then this book’s revelations about more campaign secrets will serve to undercut all that we thought we knew about past elections. Those familiar with the Kenned family and the history of Joe Kennedy’s wealthy empire will be fully aware of the bootlegging of illegal liquor that helped him amass such a staggering fortune. But what is often unknown, are the deep connections to the Chicago mob all leading directly to Giancana. After Kennedy took office and made his younger brother Robert Attorney General, a war was unleashed on the American mafia. It was a war that Giancana called nothing short of a double cross and the number of victims would be staggering and include the late Marilyn Monroe. The truth about Dallas is still completely unknown but after reading this book, you might find yourself with more answers than questions and view the crime in a completely different light. Posted on May 1, 2016, in Biographies, Mafia and tagged JFK, Sam Giancana. Bookmark the permalink. Leave a comment.